I’ve had the pleasure of working with Cara DeLeon and her fabulous concept for a pediatric dentistry practice here in Savannah. Not only is she uber talented but such a motivation in watching dreams come to life! Her practice is now accepting new patients to schedule an appointment for your little ones today! Cara wanted to go with a pirate theme for the practice so we accepted the pirate ship with ric rac waves. The interior of the office even has these ric rac stripes on the walls – so adorable! 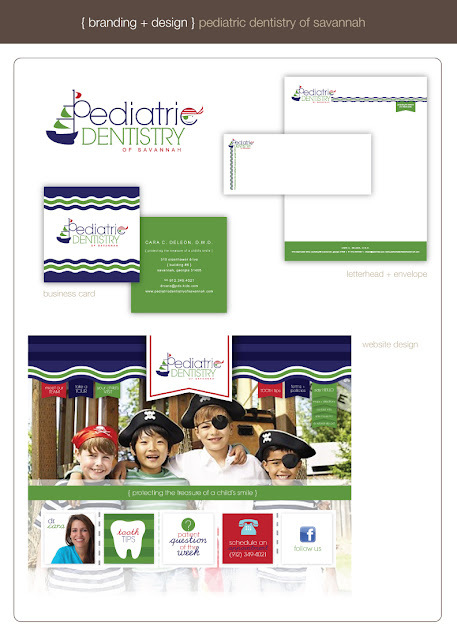 Check out her branding board below along with her new website I designed: www.pediatricdentistryofsavannah.com.